New for 2019! Formuler Z7+ 5G with Dual Band WiFi only £104.95! Thread: New for 2019! Formuler Z7+ 5G with Dual Band WiFi only £104.95! FORMULER Z7+ 5G WITH DUAL BAND WIFI! AVAILABLE IN BLACK OR WHITE! UK NEXT WORKING DAY SHIPPING! SPECIAL DEALS FOR TRADE AND RE-SELLERS, CONTACT US FOR DETAILS! DUAL BAND WIFI 2.4GHz / 5.0GHz! HISILICON QUAD CORE 15000 DMIPS CPU! 2GB RAM + 8GB eMMC FLASH! FORMULERS EXCLUSIVE MYTYONLINE IPTV APP PRE-LOADED! SUPERB FAST PERFORMANCE WITH KODI AND PLEX! SUPPORTS UP TO 5 STALKER / XTREAM PORTALS! 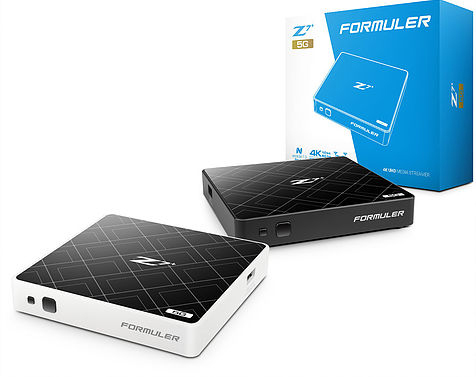 FORMULER Z SERIES ARE OUR BEST SELLING IPTV SET TOP BOXES! CLICK HERE FOR FULL SPEC AND TO ORDER YOURS! LOW COST EUROPEAN SHIPPING RATES TO REPUBLIC OF IRELAND, BELGIUM, DENMARK, GERMANY, LUXEMBOURG, NETHERLANDS, POLAND, SPAIN AND MORE! Video demo/tutorial for Formuler's MYTVOnline IPTV USB Recording and Timeshifting Tutorial. App pre-loaded on the Formuler Android range. SEE THE FULL FORMULER IPTV RANGE HERE.